As we have mentioned in a couple of previous posts, one way of looking at the situation in Syria is almost as a civil war between the Alawites (an offshoot of Shia) who constitute the bulk of the regime, and the Sunnis who constitute the bulk of the rebels. 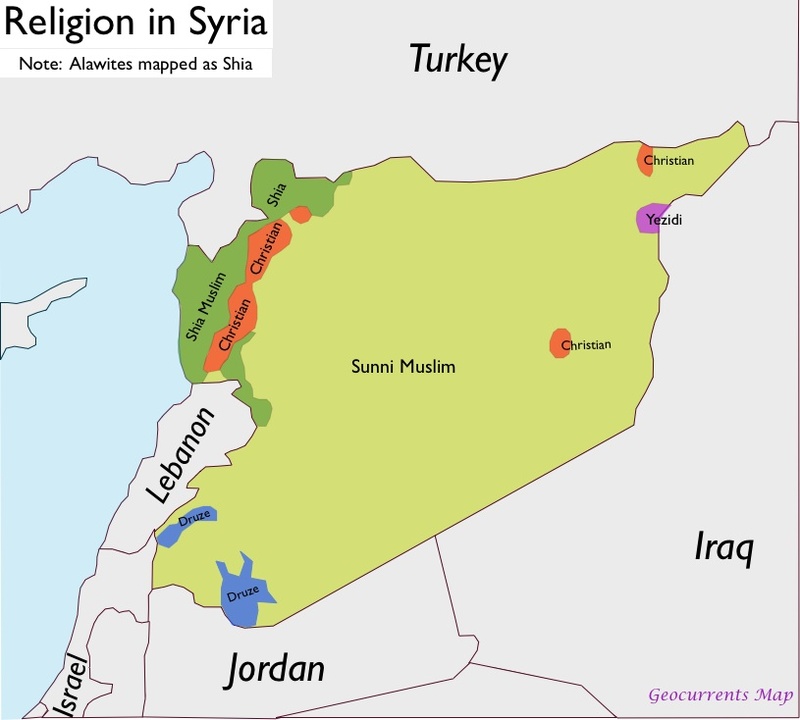 Although Assad's Alawite sect makes up only 12% of the country, they hold the bulk of the positions in government and the state security apparatus. Meanwhile, the Sunnis make up anywhere from 60-75% of the population, and constitute the vast bulk of the rebellion. Thanks for the information, though it is a bit depressing. Given how bad things are in Syria are now, I was thinking that a nineteenth century kind of solution, moving borders around, might work. If Turkey is very worried about poor folks suffering in Sleppo and near them, and if Assad would not survive a day without Russian and Iranian help, why not a Great Powers conference of at least those three? Why not give Turkey some land in northern Syria, in exchange for giving equal area in its own east of less value to Georhia, Srmenia, Iran and Iraq? But this demographic map suggests that this would be a mess, with Sunni Turkey closest to Shia/Christian areas, and Shia Iran and Iraq next to Sunni areas. Also, rebel activity in Aleppo looks a bit like Sunnis attacking a Shia/Christian area, if I understand this map correctly. What a mess! What is interesting to note about then current wars of religions that no one seems to make the connection is that more Moslem's have been killed by Moslems than Moslems by Christians or Jews combined. Then let us ask who are the real killers Christians or Jews. I would be willing to accept the notion that more Moslems have been killed within the end of WW2 than Jews were killed during WW2. If the pace of Moslem slaughter continues at and accelerates at an increasing pace then maybe just maybe the deaths of Moslem will outpace the births of Moslems and we will be rid of the plague of locusts.